Last weekend I got all the pieces for my drawers cut out and I got a single test half blind dovetail joint cut and tested. So, what'd I get done this week? I had a pretty busy week outside of the shop. I tried a Body Pump™ class on Monday, I had my usual Save the Multiverse game on Tuesday, my bi-weekly board game night on Wednesday and my Mass Effect 3 game night on Friday. Despite that I did get one drawer put together during the week. I got that drawer installed Saturday morning and voila! The plans were right, my math was right and I executed it right. The drawer (tray) installed without any issue. Yay! I've got to admit installing drawers on slides always makes me nervous. I think it's because while they have some leeway in installation they don't have a ton. It's kind of that moment of truth: Are they just going to work or and I going to have to do a lot of work to adjust for a crooked case. But I got one! Saturday was a bit busy too... 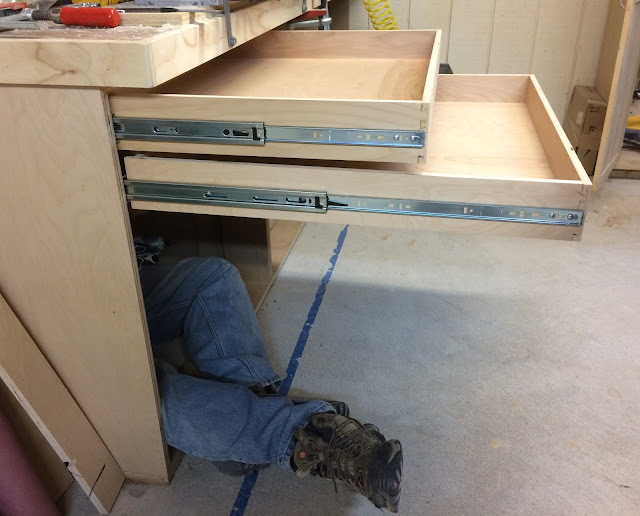 I didn't get into the shop until later in the afternoon so pretty much all I got done was to get the single drawer installed. Today though I got pretty much a full day in the shop. Before lunch I routed all the half blind dovetails on all my small drawers and put three of them together so the glue could cure while I ate my lunch. Before lunch I was optimistic enough to be thinking that I was making such good progress I'd have to figure out what to do once my bench was finished. I was counting chickens again though. I did make good progress today. I use the same technique as Norm which is to cut bracers to the height the slide needs to be mounted on the side. Then it only takes one hand to hold it in place and the other hand is available to drive the screws. I didn't have to worry about what to do after the drawers. Though I am happy with the progress I made, I only got six drawers put together and four of them installed today. I can hear it now, "Hey! That doesn't look like the last layout you had!" After installing the first tray I realized I'd been too pessimistic on drawer spacing so I redesigned the drawer layout again. 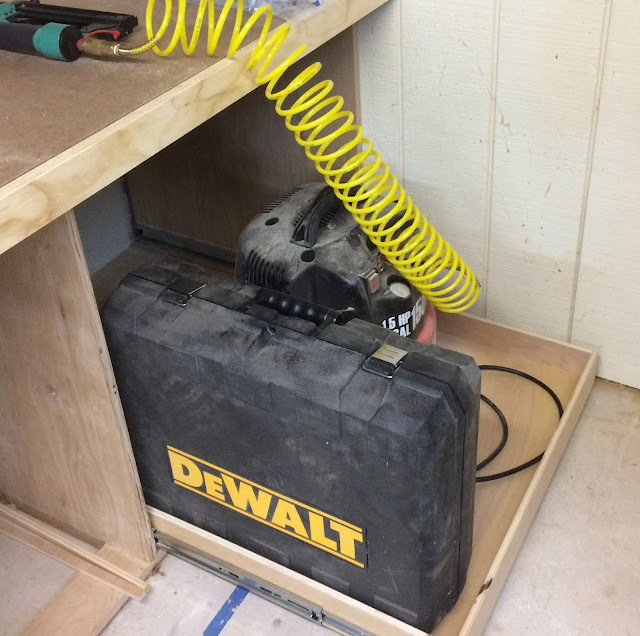 Also I was afraid my medium drawers would be too small to hold any tools. So I added more small drawers to the side compartments and added two large drawers to the middle compartment. I've got a much less busy week ahead of me so I am hoping I can make some progress before next weekend. 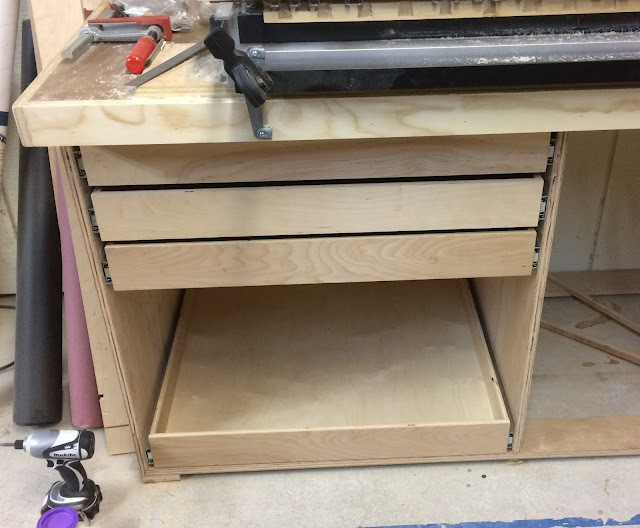 I'm short a couple of drawer slides and I need to cut the parts for another large drawer as well as reset the dovetail jig for the larger drawers. My local Woodcraft hasn't been carrying a very good selection of drawers slides so I am just going to order them from Amazon. They'll be here soon enough. Cutting another large drawer shouldn't take too long. I'm hoping that if I can get into the workshop some evenings this week I'll be onto installing drawer fronts and hardware next weekend. If I can be done with the workbench by next weekend I'll be quite happy.